Issued: 2 am 19 Apr 2019 (local time). 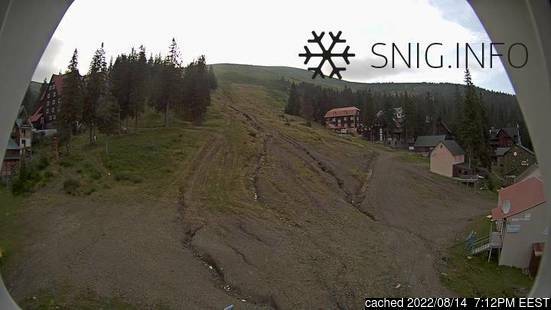 The snow forecast for Drahobrat is: A light covering of new snow, mostly falling on Sun afternoon. Becoming milder with light rain (total 2.0mm) on Sun night. Freeze-thaw conditions (max 2°C on Sat afternoon, min -1°C on Fri night). Winds decreasing (fresh winds from the NNE on Fri morning, calm by Sun morning). Drahobrat Weather (Next 3 days): The snow forecast for Drahobrat is: A light covering of new snow, mostly falling on Sun afternoon. Becoming milder with light rain (total 2.0mm) on Sun night. Freeze-thaw conditions (max 2°C on Sat afternoon, min -1°C on Fri night). Winds decreasing (fresh winds from the NNE on Fri morning, calm by Sun morning). Drahobrat Weather (Days 4-6): Moderate rain (total 17.0mm), heaviest on Mon afternoon. Mild temperatures (max 7°C on Wed night, min 2°C on Mon morning). Wind will be generally light. Moderate rain (total 17.0mm), heaviest on Mon afternoon. Mild temperatures (max 7°C on Wed night, min 2°C on Mon morning). Wind will be generally light. A light covering of new snow, mostly falling on Sun afternoon. Becoming milder with light rain (total 2.0mm) on Sun night. Freeze-thaw conditions (max 2°C on Sat afternoon, min -1°C on Fri night). Winds decreasing (fresh winds from the NNE on Fri morning, calm by Sun morning). The above table gives the weather forecast for Drahobrat at the specific elevation of 1528 m. Our sophisticated weather models allow us to provide snow forecasts for the top, middle and bottom ski stations of Drahobrat. To access the weather forecasts for the other elevations, use the tab navigation above the table. For a wider view of the weather, check out the Weather Map of Ukraine. I've been to Dragobrat last week (end Feb 2015). All in all, I liked it very much. Don't expect the Alps. There are 2 chair lifts, 6 longer T-bar lifts and a couple of learning lifts. The lifts are a little older, but not very slow (which is the case in Slavske). All lifts are connected with each other, but don't expect any map or signs! When the weather is good it's pretty clear how to go from one to another. Otherwise, just follow a local on good luck :) The main negative point about the lift system is all the different owners. They belong to hotels and for every lift you should buy a different pass. When they fix this, it would be much better. The slopes are prepared with a piste Bully every night. Again, not the quality, like the Alps, but acceptable. There are many safe possibilities to ski off-piste. There is more snow than anywhere in Ukraine, mainly because of the attitude. The highest peak, in Bukovel, is 1370m. And the bottom of the slopes, in Dragobrat, is 1340. We waited maybe 2 minutes for the lifts maximum. But we skied Monday-Friday off season. I heard it's busy during weekends and crazy from 30 Dec- 10 January. Transport: You should go to the town of Yasinya first. From Kyiv there is a comfortable direct night train which leaves Kyiv at 4pm and arrives in Yasinya 10 am. From Ivano Frankivsk there are many (shared) taxis, minibus, big bus etc. The road from Yasinya to Dragobrat is really bad. Actually, there is no road. It's mud, snow, stones, ice... Please do not even think about driving the road yourself (or you are an experience 4x4 driver). Dragobrat: There are many hotels, guesthouses and cafés in Dragobrat. It's good to book ahead. Prices are very acceptable, especially including dinner and breakfast. Most hotels are within a 5 minute walk to the slopes. Best place to stay is not far from Hotel Dragobrat. All lifts/slopes have one or more restaurants for a drink or lunch. And again, prices are, by western standard, very good. Try to get a fresh shaslik (pin with meat from the BBQ). Most people in the restaurants speak a few words of English. Knowing the cyrillic alphabet is a very good idea. But most people are very friendly and used to tourists. As long as you aren't Russian you will be fine! There is no bank of ATM in Dragobrat. So bring plenty of cash! I didn't see any money changer as well, but maybe the bigger hotels can help. Some accept cards (debit and credit). Ski-Rent is not too good. The renting is per day. That means that you bring the equipment back at the end of the day and take your shoes before having a beer. That's the good part. Material is pretty old. When you have something comfortable they can make a reservation for the next day. As everywhere in UA you must leave your passport as a deposit. When I go there again I take my own ski boots! But maybe I was unlucky, because my friend had very good ski boots. The atmosphere in the town is really good. Everybody comes there to ski/snowboard (and most are really good). Lots of young people. 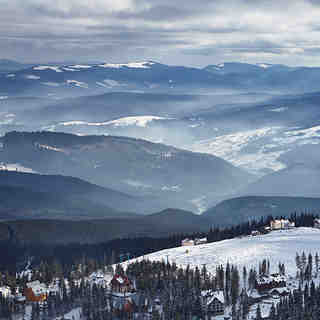 When I compare it to Bukovel, Dragobrat has a better atmosphere, nicer people, more relaxed. But less quality lifts and slopes than Bukovel. But much better than, for example, Slavske. A combination of a few days Dragobrat and few days Bukovel is a good option if you wanna ski in the beautiful Carpatian Mountains. Have fun!